Great show Guy alot of good info and super funny. 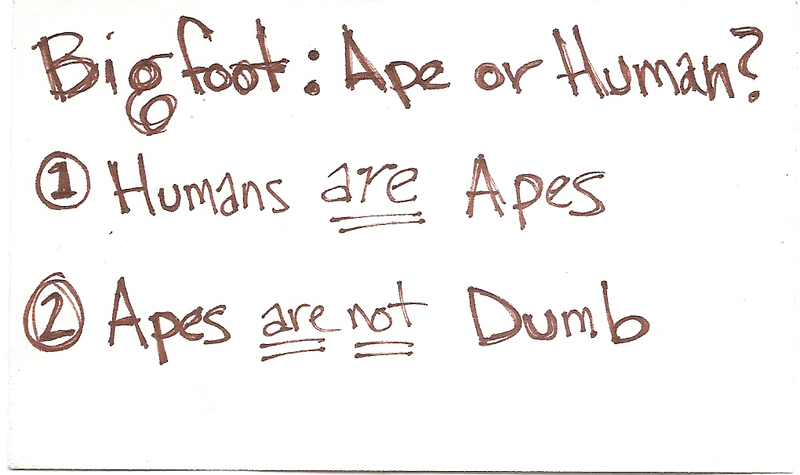 I think your explanation on the ape or human discussion was humorous only because it does seem like an obivious conclusion. I also think the argument is kind of a waste of time and effort. Anyone who has watched gorillas and their social stucture would never call them dumb or incapable of learning. By the way that would be a awesome t-shirt. If anyone reading hasn't listened to the podcast, do so. Me being involved in hip hop I was laughing so hard imagining this OG Bigfoot book, the dancing hookers, the glass Bigfoot chains, and Hollywood talk. I was like wheres the Dom P and Maybach? Thanks again Guy for bringing all this info to us and doing it well. I gotta give lot a credit to Ro Sahebi, Michael Merchant, Damian Bravo and Shawn for giving me a reason to "bring it" every time I do the show. They are so professional, open-minded, curious and above all inspiring. Keep your comments coming Joaquin, it's fans like you that make this blog fulfilling to me. I loved your statement!! I totally agree that its not necessary to argue, and thanks for answering my question (although it was about the Gigantopithecus theory again haha). 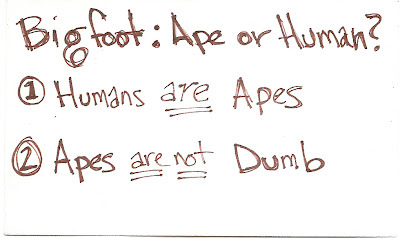 Sorry if I'm getting annoying about it, just my favorite thing is to discuss what fossil species people theorize Sasquatch are (NOT whether they are more ape or human). It was great to see you on the podcast again, you add a great element to it! Thanks again, and have a nice day! According to the *Experts*, the recent news is...Sasquatch is human. ;) And needs protection. Oh and has a sprinkling of Angel DNA for good measure.